Eating well is a challenge in itself, and eating healthy food that is also produced sustainably can be even harder. This July, challenge yourself to think more about where your food is coming from, and make whatever changes you can to move towards sustainable eating. While this post is meant to guide you about environmentally-friendly diet choices, it is also important to consider the social sustainability of your food, like the labor conditions under which it was produced. Seafood is often a very healthy form of protein – most types are low in fat or high in “good” fats, like omega-3. Just be aware that fish higher on the food chain (sharks, swordfish, king mackerel, marlin, orange roughy, tilefish, bigeye and ahi tuna) is more likely to contain higher levels of mercury. Here is a Mercury in Fish guide you can print out and keep in your wallet to help you choose options with the lowest mercury. Approximately 3 billion people rely on seafood as their primary source of protein, but unfortunately, an estimated 85% of global fish stocks are overfished. The seafood industry can also harm the environment not just by depleting target species, but also by unintentionally catching non-target species like sea turtles, dolphins, and others. Aquaculture, the farming of marine organisms for food, can have detrimental impacts as well: pollution in the form of concentrated waste products, pesticides, and antibiotics, as well as elevated risk of disease and parasite spread. Fortunately, it has become increasingly possible find sustainable wild-caught and farm-raised fish! Sustainable seafood now makes up 14% of global seafood production, compared to only 0.5% of seafood production in 2003, and buying sustainable seafood will help this industry grow even more! Download the Monterey Bay Aquarium’s easy-to-use Seafood Watch app for iOS and Android or print a Seafood Watch consumer guide to aid you in making sustainable seafood choices. The Seafood Watch program focuses on seafood found in the US marketplace – see this list of international resources to find a suitable guide for your region. Meatless Monday, and vegetarianism in general, isn’t only about animal rights. Eating less meat is also more environmentally sustainable, in terms of both production inputs and waste outputs. It takes a lot of water and grain to produce one kilogram of meat. Beef is especially resource-intensive: it takes 7 kg of grains and a whopping 43,000 liters of water to produce 1 kg of beef. Check out this nice infographic for more information. In addition, waste from animal feces, when produced in large quantities, can seep into water sources, contaminating drinking water and causing ecosystem imbalances due to excess nutrients (nitrogen and phosphorus). 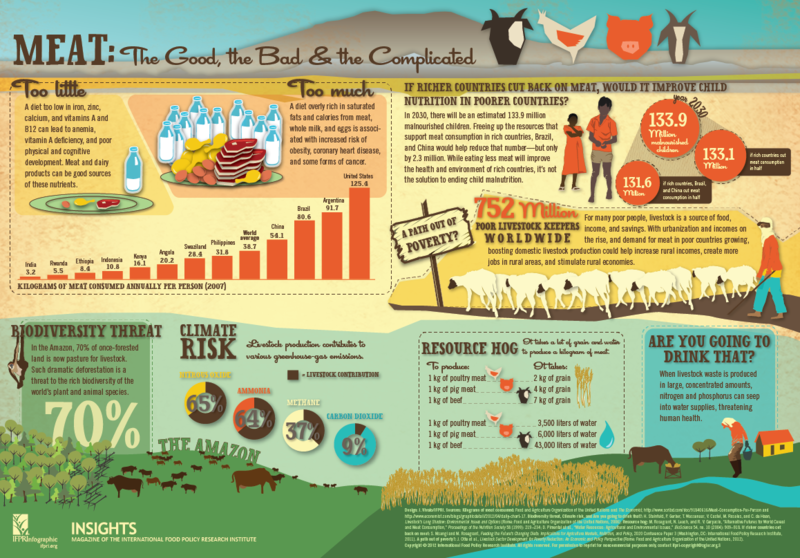 Livestock also contributes to greenhouse gas emissions, including nitrous oxide, ammonia, methane, and carbon dioxide. Finally, pasture for livestock results in deforestation in many places around the world, including the Amazon, threatening the persistence of rare species that occur nowhere else on the planet. Try to reduce your meat consumption, especially of beef, and challenge your friends, family, and coworkers to do Meatless Monday with you! Choosing local food can have many benefits: it supports your local farmers, is often fresher, and requires less transportation (which can lower its overall carbon footprint). In addition, local food is often more traceable – it is easier to know whether what you’re eating was produced in a socially and environmentally responsible way. See here to find local farmers’ markets in the US!